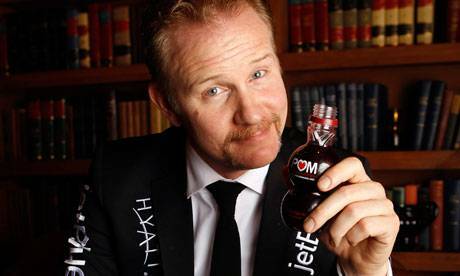 Morgan Spurlock’s POM Wonderful Presents: The Greatest Movie Ever Sold (which is the film’s official, fully-branded title) has divided critics – accordingly to reviewers, the film is either a brilliant work of satire that is a fresh take on modern marketing/advertising techniques, or it’s a wimpy sell-out of a pseudo-documentary that fails to properly take the modern marketing machine to the mattresses. Personally, I think it’s a bit of both (or, conversely, neither of those things), which means that the film is actually quite thought-provoking. In other words, it’s exactly Spurlock’s open-ended approach – his refusal to tell the audience what to think – that makes this an interesting film. Still, it’s not so much a film as an invitation to take a moment to ponder how your own brain is actually processing the daily onslaught of advertising to which we are all exposed. The premise is simple but oh-so-meta: make a movie about advertising/product placement that is entirely financed by product placement and advertising. It’s not only the premise that is “meta” in that way – virtually every scene leaves you looking for a mental foot-hold. One scene is a clip of Spurlock on the Jimmy Kimmel show, talking about the film as part of the promo tour, wearing a suit covered with the brands that sponsored the film – which the audience saw being discussed earlier in the film as a sly, so-obvious-it’s-clever marketing gimmick. By way of explaining the film’s concept to the talk-show host, Spurlock says, “This is it. This is the film right now!” It’s enough to make your head spin – but in a good way. 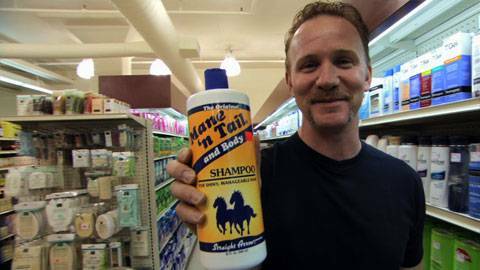 Spurlock deliberately stays away from making an obvious, political statement about marketing and advertising. Instead, he creates a hall of mirrors where the audience is, ultimately, forced to look at themselves. He is smart to stay away from taking a completely “advertising is evil” stance – that would be too easy. After all, the marketing folks who like to sneakily or not-so-sneakily feature branded products in darn near every form of entertainment are not exactly everyone’s favourite people. 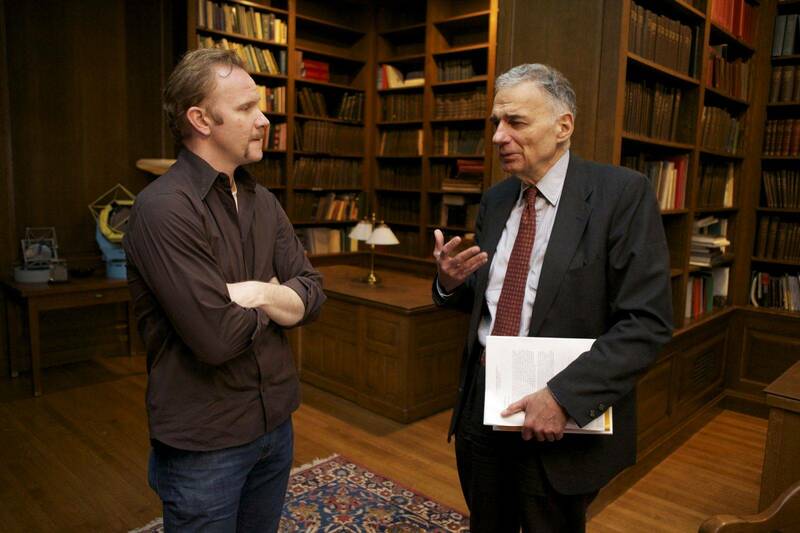 Morgan Spurlock and Ralph Nader in The Greatest Movie Ever Sold. Even Donald Trump, who is interviewed at one point in the film, acknowledges that it’s a bit of a deal with the devil to brand oneself or one’s artistic endeavours in that way – in fact, he tells Spurlock that filmmakers should just “take the money and run.” Plus, Spurlock can’t really throw his own corporate sponsors under the bus, of course. However, he doesn’t need to do that in order to achieve his main objective, which is to simply give the audience a brief pause for thought. It’s true that The Greatest Movie lacks depth. In the end, it’s a film about nothing in particular; it’s all style versus substance, which can be said of a lot of things that are marketed as “the greatest (fill in the blank).” It’s still honest, though – or as honest as anything can be these days – in that it’s not pretending to be anything other than a marketing vehicle about…marketing. Except, of course the film does manage to be more than that, and that’s Spurlock’s point – we are all more than what we are selling, and we should try not to forget that, even as we are busy selling out. The Greatest Movie Ever Sold opens today (May 6) in Toronto, Montreal and Vancouver (at International Village). This entry was posted in reviews and tagged documentaries, Donald Trump, marketing, Morgan Spurlock, Ralph Nader. Bookmark the permalink.